It is obviously clear by now that I love wine. Winespiration is usually my best inspiration. Aaaaand as a mom to a toddler, the time I have available to get craft projects done is at a premium so I often resort to the middle of the night when everyone is sleeping and I can’t be bothered. It is also a great time to drink wine! So, as part of our late night wine drinking craft series, my friend Beth and I stayed up late TWO nights (it should have only taken one night but we talked and drank too much to finish on the first night) to make this amazing Ruth Bader Ginsburg Wine Bag. The gavel shaped wine key pocket on the back! Because RBG is always prepared and you should be too. You can of course watch the entire tutorial here. We drank a lot of wine. We had a lot of fun. And while for awhile there it didn’t look like we would ever be able to get this wine tote done….we did! I also used two small but different sized bowls to trace the circles I needed and tracing paper to make patterns. For more details on how I use tracing paper and other measuring tools check out this tutorial. Cut one inch off of the long edge of two of your pieces of black felt. Keep the one inch strips to use as the handles. Fold your piece of cream felt in half so that the short sides meet and then use your fold line as your guide for cutting your piece of felt in half. Now on one of the pieces cut a one inch strip off of what is now the short side so that it matches the width of your black pieces of felt. Use a small bowl (I made sure the base of my wine bottle fit into my bowl to make sure it was large enough) to trace a circle on black felt for the base of your wine bag and cut it out. Take your slightly larger bowl and place it over the piece of felt that is left from cutting the base out. Make it slightly off center and then trace around it and cut it out. This is the dissent collar and so will have the same neckline as the base of your circle. This is hard to describe so go check out the youtube tutorial to really see what we are doing! Sew the gold sequins on to your dissent collar. We did this after quite a bit of wine. To see a more detailed (and probably slightly more accurate version) check out my RBG Coffee Cozy tutorial. Then you can simply pin your tracing paper to your felt and embroider over it. When you are done, the tracing paper will tear away easily! For more tips on embroidery…I have a tutorial on that too! Check it out the video here. Now it is time to make the crown and the gavel. Simply draw a gavel and a crown out on tracing paper to use as a pattern. Then pin it to your felt and use the pattern as your cutting guide. If you don’t feel like you can draw a gavel and a crown, you can always print a photo off on the internet and trace it! Now it is time to sew. First sew your dissent collar to your piece of cream felt. Then sew the crown onto the cream felt. 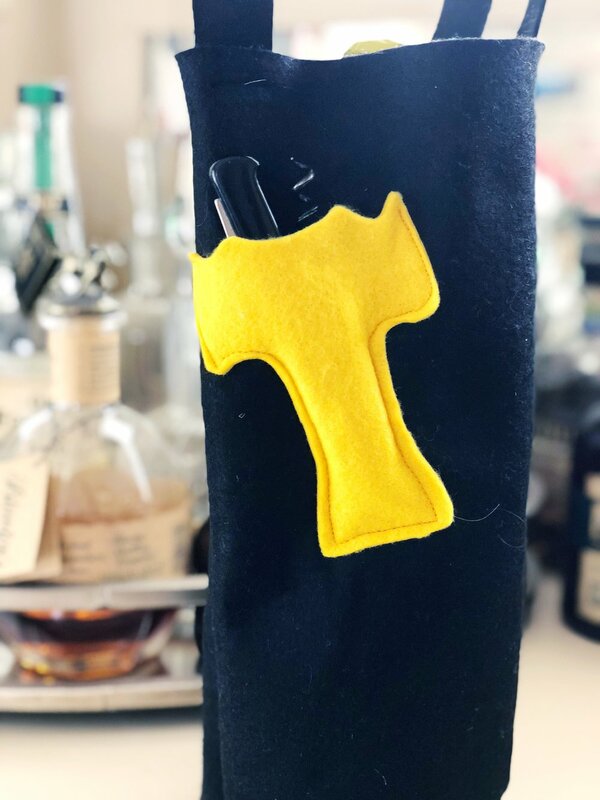 Sew the gavel onto the back side of the black felt and then you can pin the two black pieces of felt together with the face and collar pinned in too and sew the each side of the bag up. You can do this either with right sides facing each other so that the seems are inside the bag, or since it is felt and won’t fray, you can sew it together exactly how it will look when it is done - with the seems on the out side. Now all you need to do is sew the bottom circle on as the base of your bag and then take the two one inch straps and sew each of them on to the top of the bag as handles! And you will now be everyone’s favorite party guest! 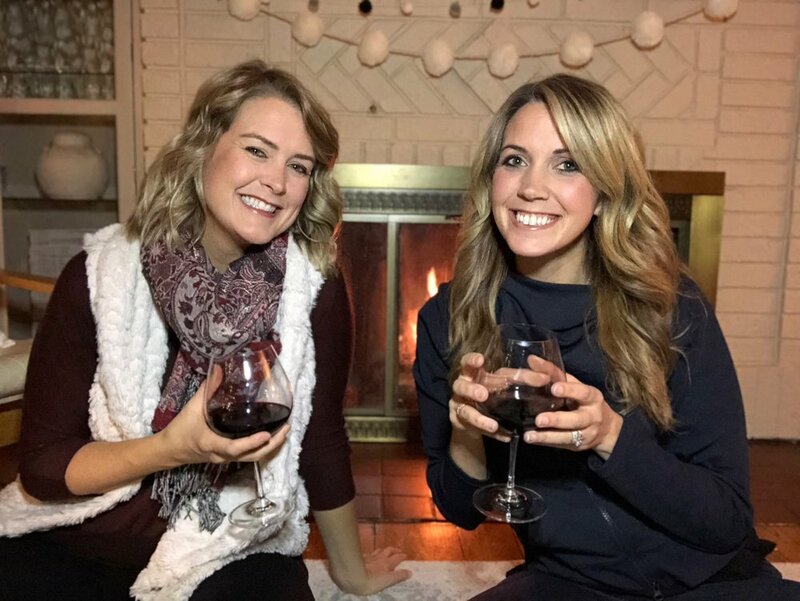 Don’t forget to go check out my channel, like this video and subscribe so you don’t miss any of our fun and winespired DIY projects! Here we are drinking wine and getting our wine fueled inspiration for our RBG Wine Bag!